A while back, I wrote a post on Homemade Microwave Popcorn that was enjoyed by many. The simplicity of it was shocking. All you have to do to make your own microwave popcorn is put popcorn in a paper bag! Isn't that crazy? I also featured a cool book on adding different flavors to popcorn (see below). Okay, great idea, but for a gal that knows she will never take the time to do this... what store bought microwave popcorn should I be purchasing? You know something, Kat, Snack Girl has also been known to never take the time to fill bags with popcorn. Yes, I take off my Snack Girl cape and buy packages of microwave popcorn (in disguise, of course). 1. It is packaged in 100 calorie packages. Hurray! 2. They give all their profits to charity. 3. The ingredients list is popcorn, palm oil, salt, natural flavor, vitamin E. 5 ingredients - all of which I understand. This tasted a little bland to me, but then I can choose to add other stuff to it (like crab cake seasoning). 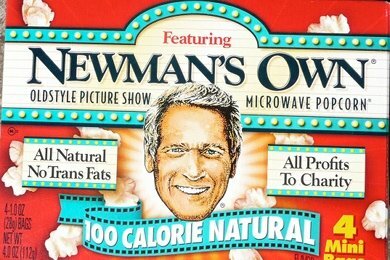 You have to be really careful in the microwave popcorn aisle because other boxes of Newman's Own are not so great. If it says MOVIE on the package it usually means it is packed with fat and salt (and sometimes sugar). My suggestion is to pop a simple popcorn and then just add some yummy flavors yourself. Hey, if you like butter, add butter! But, don't buy the crappy butter flavor microwave popcorn. Add REAL butter (yum). This is a great healthy snack to add to your lunch box or your kids lunch box. For your child, it is packaged (they LOVE that) and it is healthy (you LOVE that). Please share your favorite brand of microwave popcorn. Is This A Healthy Snack Food? I really like Trader Joe's 94% fat free microwave popcorn. Ingredients: popping corn, palm oil, salt, natural butter flavor, annatto coloring,, vitamin E, citric acid. It's 130 calories, and 2 Weight Watcher's points, per bag. The bags are smaller than the usual micro-popcorn bag. I made air popped, mix a little spenda and cinnamon, spray the popcorn with a little Olive Oil Pam, sprinkle the cinnamon mixture and do that a few times. Yum! OK, I have to speak up here because the "I don't have time" excuse does *not* apply here. In the time it takes you to unwrap the microwave package, you could have saved yourself at least 1/2 the cost of that package and eliminated a piece of plastic from your garbage. I am completely befuddled as to how store-bought microwave popcorn can save you time over pouring some kernels in a brown paper bag and putting in the microwave. I have to agree with Julie - it's so freakin' easy to dump some popcorn in a bag. It takes seconds, and even my kids do it. It's the only way we make popcorn now! I'll have to agree with the no excuse crowd. I don't have the prices at hand, but I wouldn't be surprised to find that buying and popping organic corn would be cheaper than the regular boxed stuff. Plus, the term "natural flavors" is extremely loosey-goosey. A pretty good way to hide anything you don't want to specifically list on the label. I go back and forth between making my own...and eating the "bad" stuff. Just the other day I made my 2 year old daughter and myself homemade microwave popcorn. She didn't even know the difference. Having a pack of paperbags and the kernals right there...it is quick and easy. There is a popper bowl you can buy from the store. Haven't tried it. But another "no excuse" example...as you have to pour it into a bowl anyways. I recently had to purchase a new microwave, and unfortunately I keep burning the popcorn using the paper lunch bag method. It worked fine in my old microwave at full power. Both microwaves are the same power and size. I tried adjusting the power and time, but it keeps burning. So, I have had to go back to the "bad" stuff. The Newmans you suggested is pretty good and I also add flavorings to it. Popcorn, homemade is best. Popped in coconut oil, then sprinkle brewers yeast and some sea salt. Try 1/2 tbsp good olive oil and 1/4 cup good popcorn in a large glass mixing bowl. Top it with a microwave cover and pop for about 3-1/2 minutes (listen for popping to know how long your microwave takes). I like to sprinkle a bit of garlic salt on mine when finished. You can add seasoning before popping if you prefer. I don't miss the "buttery" taste at all. It is oily enough to hold seasoning but not soggy. Microwave? Please... just heat some coconut oil and add your organic popcorn in a pan on your stove. Add sea salt & brewers yeast for a cheesy flavor & added nutrients!! The microwave will kill all the nutrients. So, I don't usually engage in conversations like this on the Internet, but I don't like to see unfounded fear being propagated. It is a fallacy that microwaves kill nutrients in food. You can certainly do dangerous things with your microwave that are not good for your health -- using plastic wrap and plastic containers, for example -- but generally speaking, microwaving food does *not* kill the nutrients in the food. As a matter of fact, microwaving most vegetables in the microwave w/ just a small amount of water retains just as many (and in some case, more) nutrients than steaming those same vegetables. I am more concerned with the chemicals that are released when you use the packaged microwave popcorn. I bought a popcorn popper and I use coconut oil and season it with salt and real butter.